While scouring through the Jason Morningstar's Bully Pulpit Games site, looking for Fiasco playsets, I ran across Dungeon Squad! 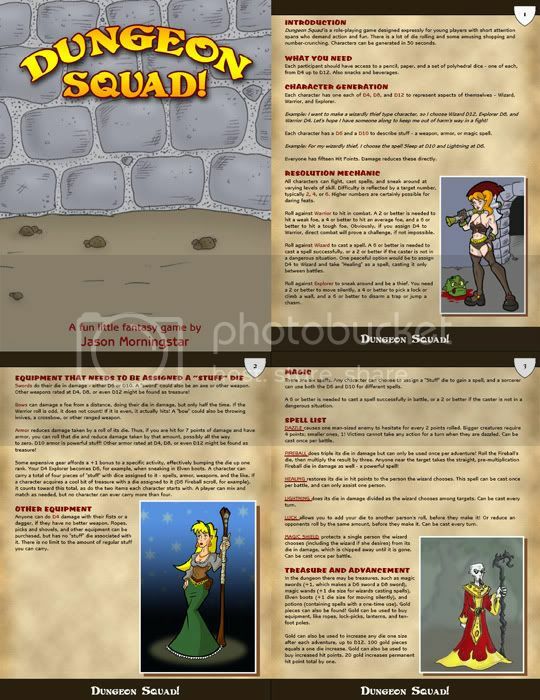 Dungeon Squad is Jason Morningstar's small, rules-lite classic fantasy RPG designed to get young folks into gaming. It's no secret that over the past few years I've been getting into old-style system-lite RPGs--QAGS (obviously), and Risus, but also older games like Tunnels & Trolls and old "Red Box" D&D. Dungeon Squad fits right in with those. The game is also nice and hackable, easy to modify and mold to lots of different settings and styles. Jason Moringstar released the game under Creative Commons, and Dungeon Squad's Wikipedia page has links to several different versions that fans have made. So yeah, I'm really digging the game so far, though I haven't had a chance to play it. I'm hoping to run it next time one of my game groups has a "beer & pretzels" night. I'm also planning on running it for my 11-year-old son. I've also been taking stabs at hacking the game myself, working on a MMORPG-pastiche fantasy game called "Epic Mount!" Last week, I found myself with some time on my hands, looking for an excuse to avoid doing "important" and "necessary" stuff. I felt like playing around with layout and Dungeon Squad was fresh in my mind. I also had a few fantasy illustrations laying around that I had done and weren't attached to anything. To make a long story short, I went and took Dungeon Squad (which was pretty much just a boring old plain text file) and jazzed it up with a fancy-shmancy layout. I think it looks pretty nice and it was a nice bit of practice for me. You can check it out here. This is seriously awesome. You've done the game justice with your layout! Thanks, it was fun to do!